Overall, Apple’s stock was up over 11% in the two days following the iPhone announcement. C’mon: no matter how closely Apple guarded the iPhone’s specs, no matter how persuasive Jobs’s rhetoric, no matter how surprised industry watchers were at the blogomediasphere’s glowing reception of the gadget, Jobs’s speech could not possibly have revealed over $8 billion in previously undisclosed information. Certainly non-insiders knew some of the details of the iPhone. Almost everyone knew that Apple would announce some sort of cell phone / iPod combo device. Moreover, the thing is not even going on sale until the summer, and then with a single carrier at a price point sure to discourage mass consumption. I’m an Apple fan, an Apple Computer Inc. investor, a Mac user for decades (and an Apple II user before that), and I’m drooling along with the rest of you over the iPhone. But still, some of that sudden $8 billion re-assessment of Apple’s worth surely stems from irrational exuberance, herding, and/or good old fashioned religious fervor. Readers may challenge me to put my money where my mouth is and (short) sell Apple. Since I’m not doing that, take all of this with a grain of salt. Dude, isn’t it simply a matter of psychology?… And why do you conclude that the price movement suggests the stock is undervalued?… That assumes the stock was correctly priced BEFORE the announcement. It could easily be argued that the stock was too low before the announcement; a result of bear-scare tactics, and insufficient information. The heart of the matter is the phone BLEW EVERYONE’S MIND and reminded people that Apple rules. Also, one percent market share is ten million phones the first year, so even that modest goal hints at killer growth to sustain the current P/E. Apple might sell more than twice that annually. But your point is well taken. The move is speculative. But had I sat on the sidelines demanding numbers to support the move, I’d have missed out on a nice gain. Good point. Concluding that the price swing was irrational does not necessarily imply that one should sell short. Isn’t part of the gain surely due to the fact that investors, when seeing the iPhone actually introduced, believe that other investors will “irrationally” bid up the stock price? i.e. some sort of meta-psychology. 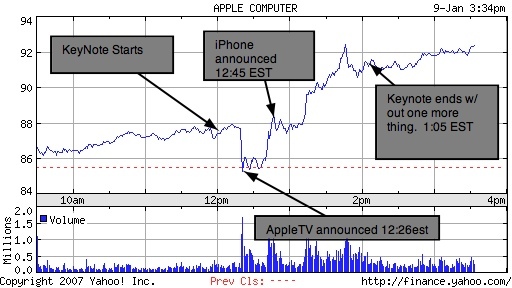 I have no particular confidence that Apple stock was “correctly” priced before the announcement. If you look at the movement in proportional terms, it doesn’t seem out of line with the value assigned by the market to Apple in general. It wasn’t just the phone — it was the astonishing number of new pieces of polish and framework involved in the phone: multi-touch, proximity sensors, OS X under the hood, Google Maps integration, WiFi and Bluetooth components (even if the iPhone itself doesn’t do much with them), the widescreen at super-high resolution — there was a lot in that announcement that Apple didn’t have to deliver in order to have something it could call an “iPhone” without embarrassment. These details add a lot of possibilities for future devices and technology from Apple; they suggest that it’s going to be a serious and sustained move into new market segments. Looking at your chart, the thing I wonder about is the drop right at the start of the program, and the climb back _before_ the iPhone announcement. The Market is far from perfectly efficient — it is, at best, kinda-eventually-sorta-mostly-Efficient. But since you brought up Apple, consider how long th iPod was out prior to Apple’s stock moving upwards: YEARS. That’s Hardly Efficient. Pingback: Midas Oracle .ORG » Blog Archive » Does wisdom require markets? Does a share price of a company react to available information such that it isnt possible for an abnormal gain to be made by using such information? Interesting. I guess efficient market theory is in a way defined by exceptions and examples of irrational hype like these. It would be interesting to see your perspective a couple of years on from this post, now that the iphone has been around and sold in record numbers, despite the price barrier. Was that speculation really irrational or was it justified? Also was it (or behaviour like it) a precursor to the burst bubble marketplace we are in today?